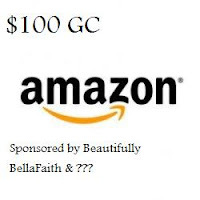 Beautifully Bella Faith is currently offering a rather fabulous blogger opportunity, in which you are invited to participate, over at their blog, which will give you a chance to make some connections and gain a little exposure as she hosts the chance to win an $100 Amazon gift card! All that is expected of you is that you pass along the buzz on your blog! The date for the gift card giveaway will be May 30th through June 7th so head on over to Beautifully Bella Faith and check it out! !